Hubble Space Telescope view of the spiral galaxy NGC 7674 (the big one seen face-on), which lies 400 million light-years from Earth. Astronomers have spotted signs of two supermassive black holes at NGC 7674's center. Not one but two gigantic black holes lurk at the heart of the distant spiral galaxy NGC 7674, a new study suggests. These two supermassive black holes are separated by less than 1 light-year and together harbor about 40 million times the mass of the sun, researchers said. The research team analyzed observations of NGC 7674, which lies about 400 million light-years from Earth, that were made by the U.S. National Science Foundation's Very Long Baseline Array (VLBA), a network of radio telescopes across North America. The researchers found two distinct, compact sources of radio-wave emission at the galaxy's center. The two compact radio sources separated by less than 1 light-year at the center of the galaxy NGC 7674. The two sources correspond to the locations of two active supermassive black holes, which form a binary and orbit around each other, a new study suggests. "The two radio sources have properties that are known to be associated with massive black holes that are accreting gas, implying the presence of two black holes," study lead author Preeti Kharb, of the National Centre for Radio Astrophysics at the Tata Institute of Fundamental Research in India, said in a statement. These two behemoths orbit their common center of mass about once every 100,000 years, the researchers said. The two newfound black holes probably sidled up when their former host galaxies merged to form the current NGC 7674. (Most, if not all, galaxies are thought to have supermassive black holes at their centers.) This supposition is bolstered by the twisted, Z-like shape of the galaxy's radio emission — a large-scale structure thought to be produced by a galaxy collision, study team members said. "Detection of a binary supermassive black hole in this galaxy also confirms a theoretical prediction that such binaries should be present in so-called Z-shaped radio sources," co-author David Merritt, of the Rochester Institute of Technology in New York, said in the same statement. 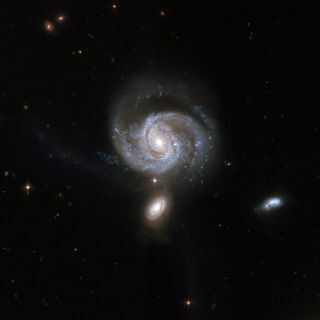 The new study was published online Monday (Sept. 18) in the journal Nature Astronomy. This story was corrected on Sept. 22 to state that the observations were made by the Very Long Baseline Array, not the Very Large Array.